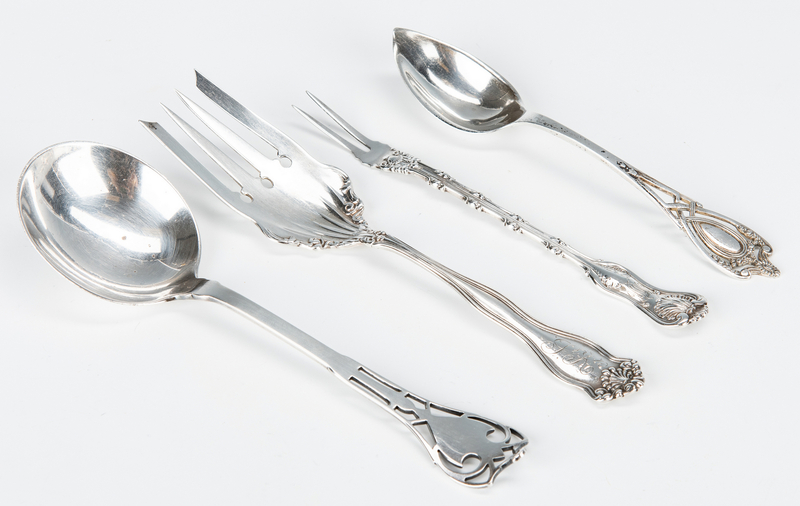 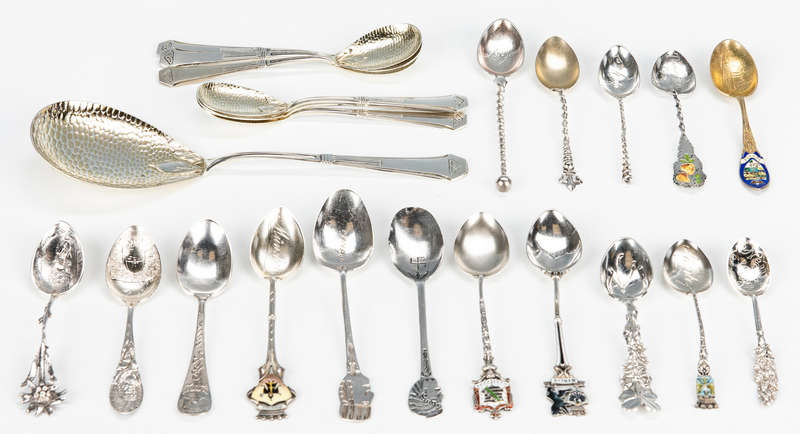 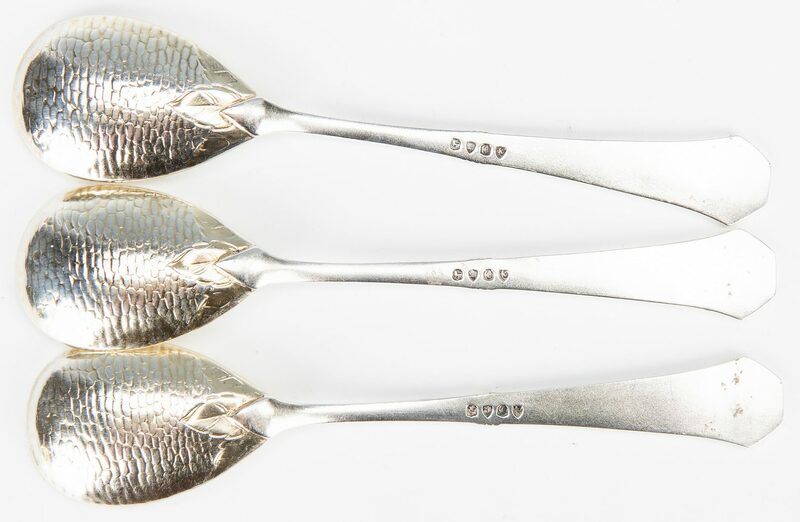 Total 50 assorted sterling and other silver flatware and tableware. 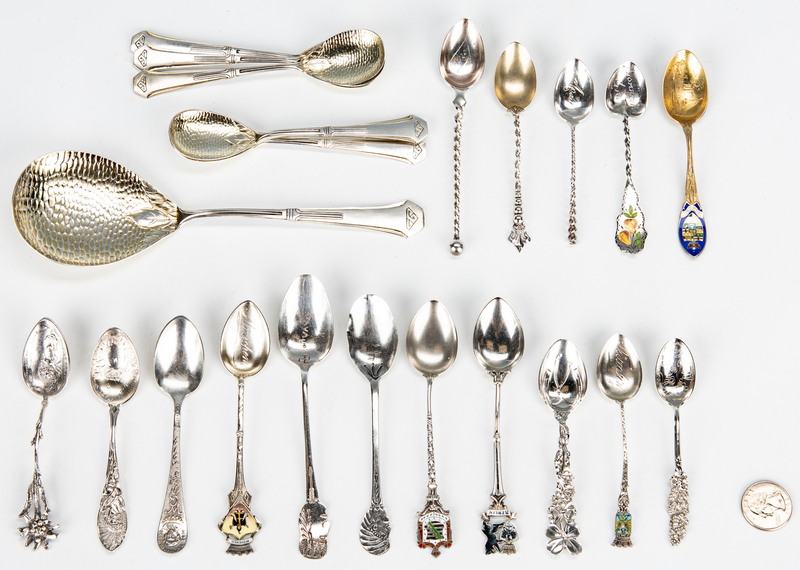 1st assorted 27 items: Group of Russian & American silver, 27 items total. 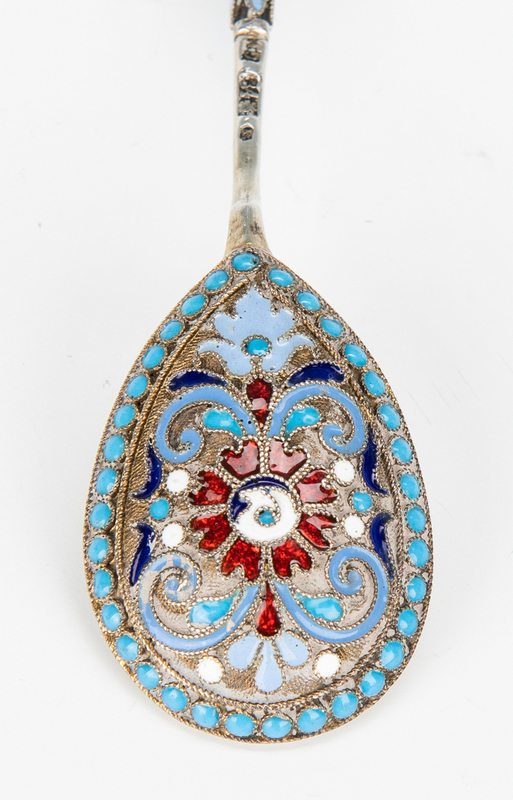 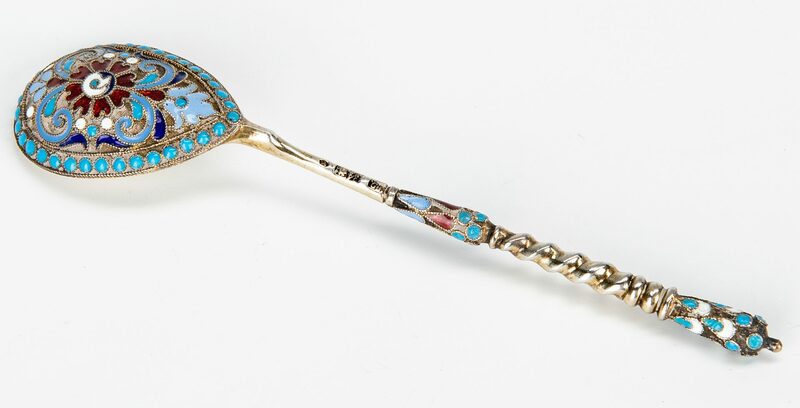 1st item: Russian silver gilt spoon with cloisonne enamel decoration and twist handle, hallmarked 84 standard, maker's mark for Stepan Levin (working Moscow, 1875-1897), 4 3/8" L. .535 oz troy. 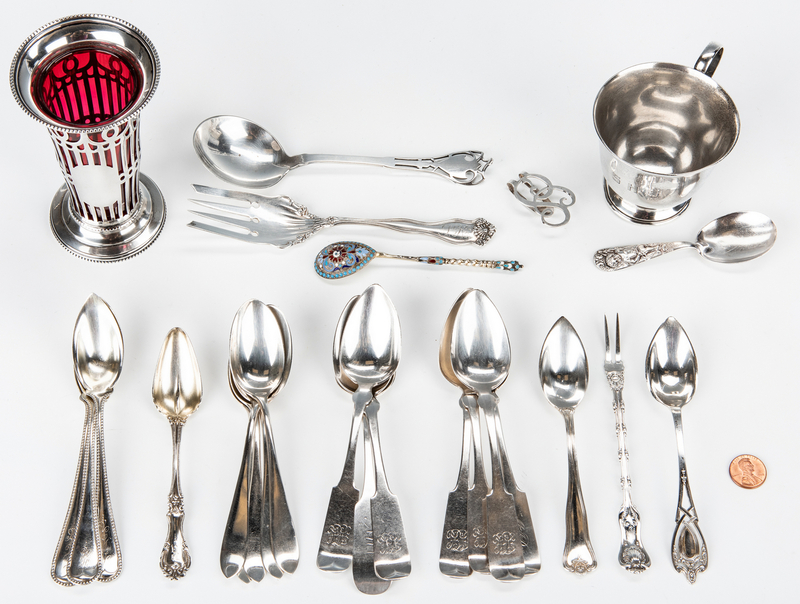 2nd group: 17 assorted American sterling items including 16 assorted flatware by various makers and 1 monogram "B" money clip, 11 oz troy. 3rd group: Set of 6 O.D. 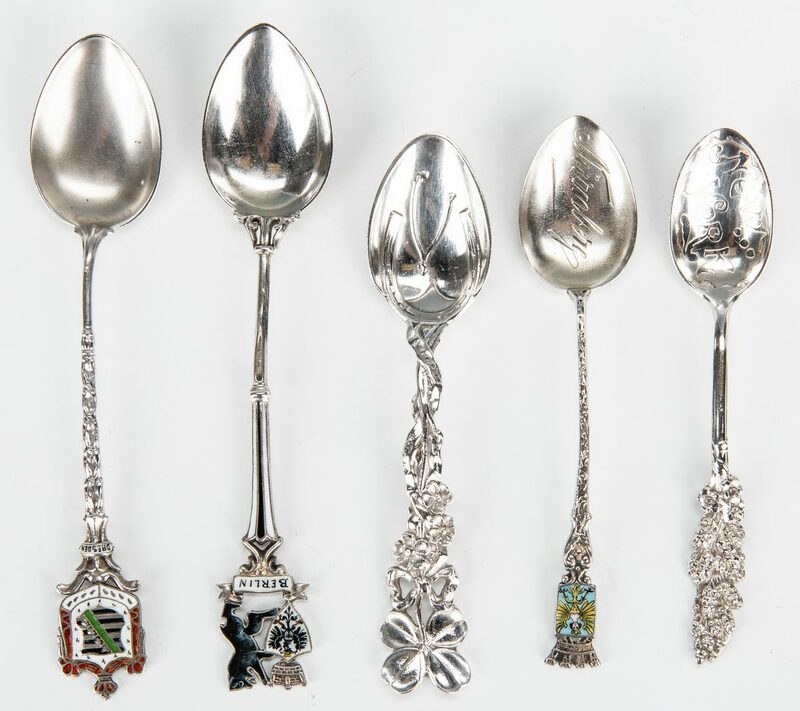 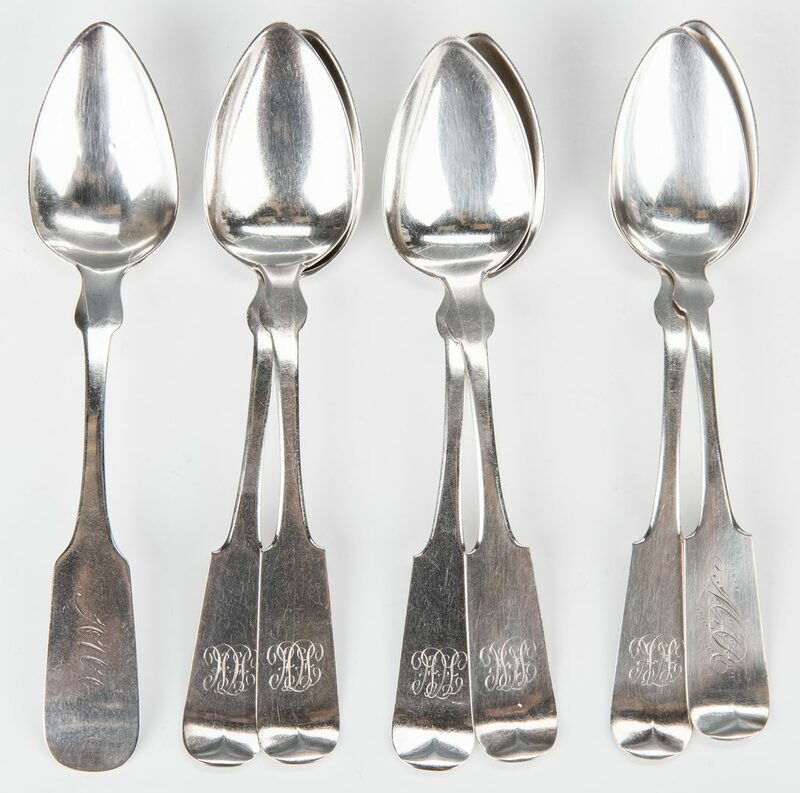 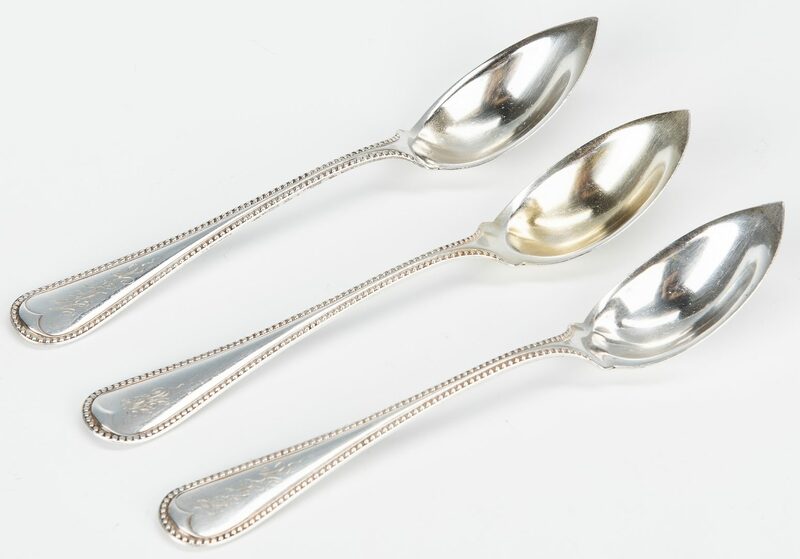 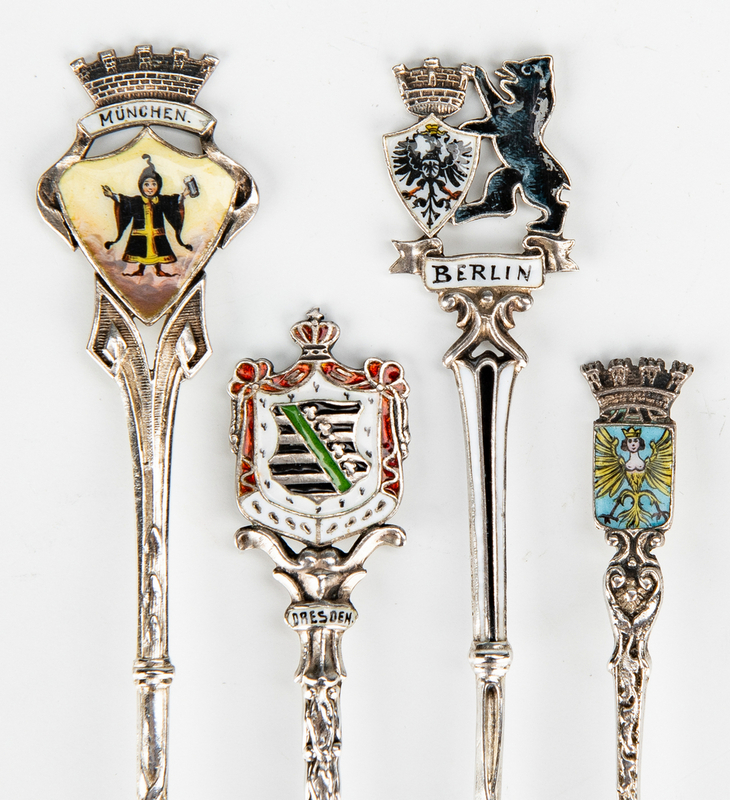 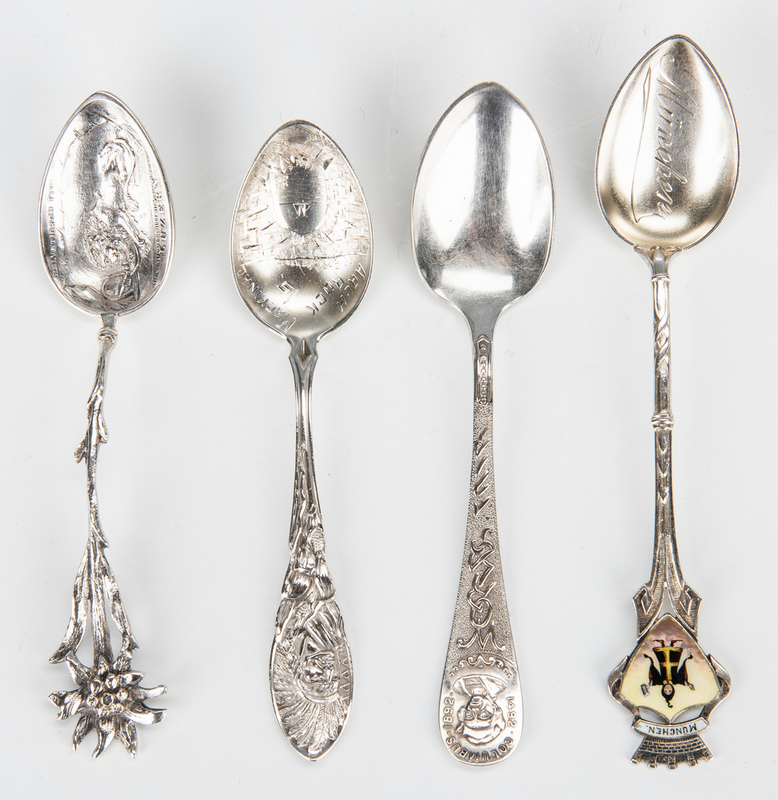 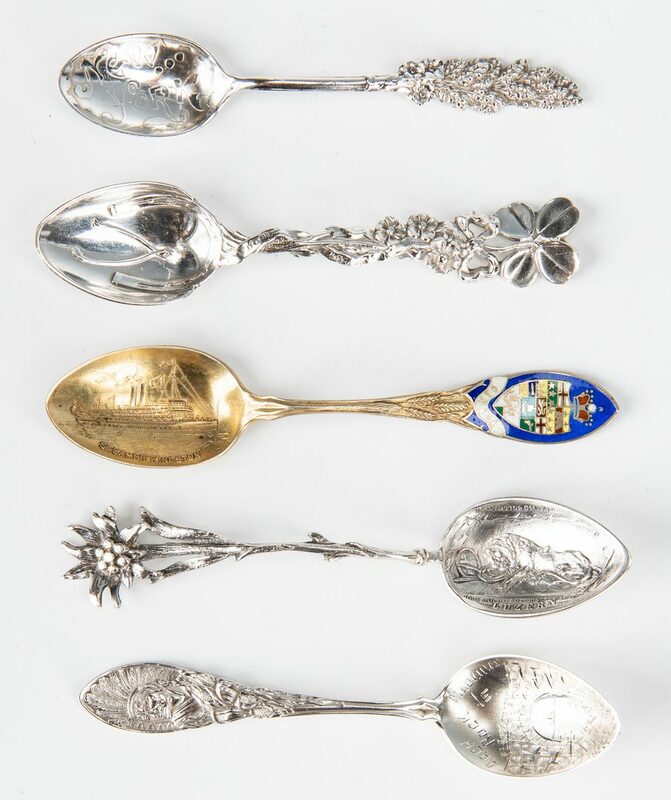 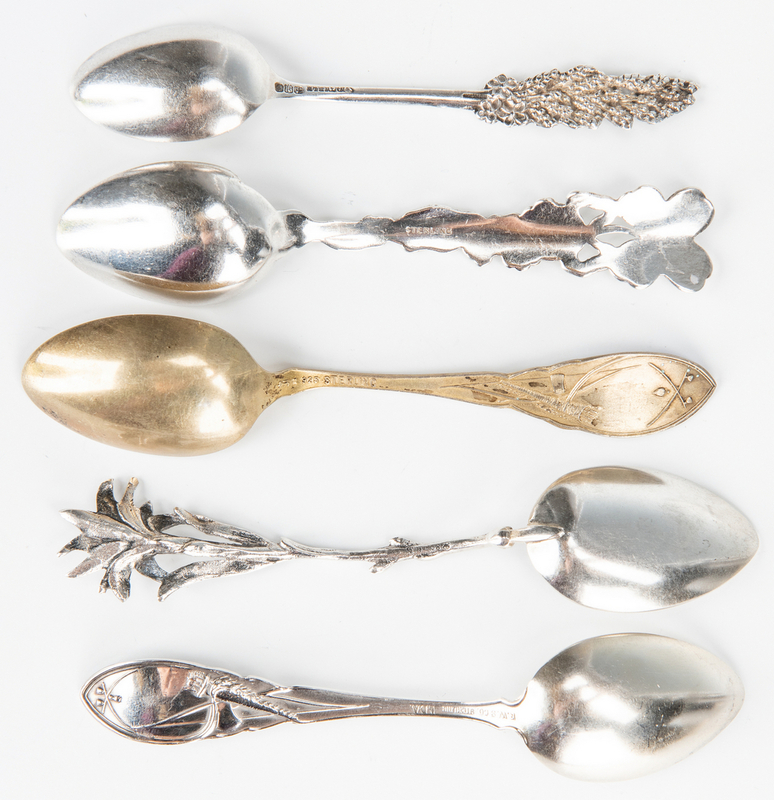 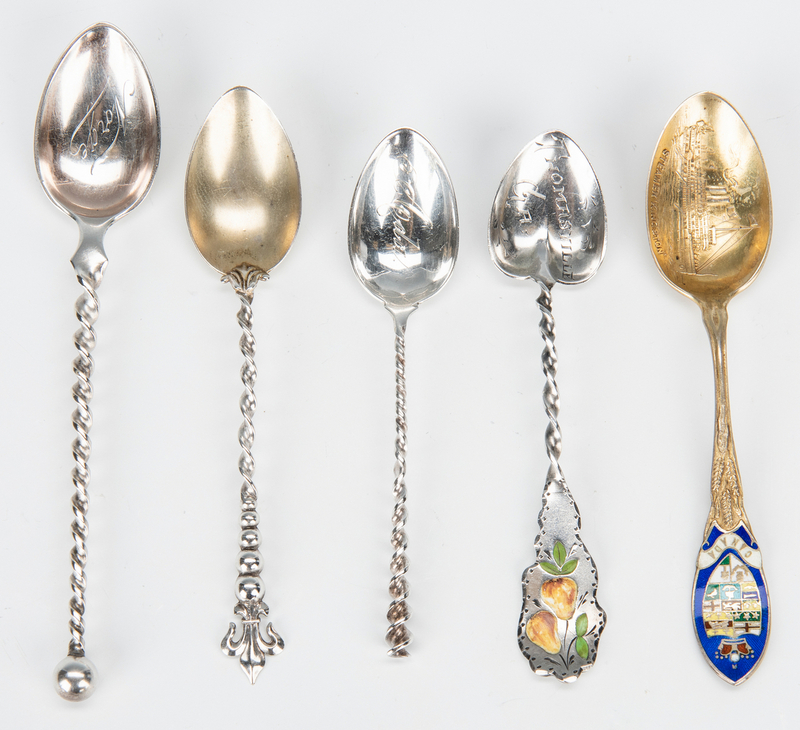 Seymour (Hartford, CT, c. 1850) coin silver teaspoons and 1 E. Benjamin (Everard Benjamin, New Haven, CT., c. 1830-40) coin silver teaspoon, all monogrammed, 4.225 oz troy. 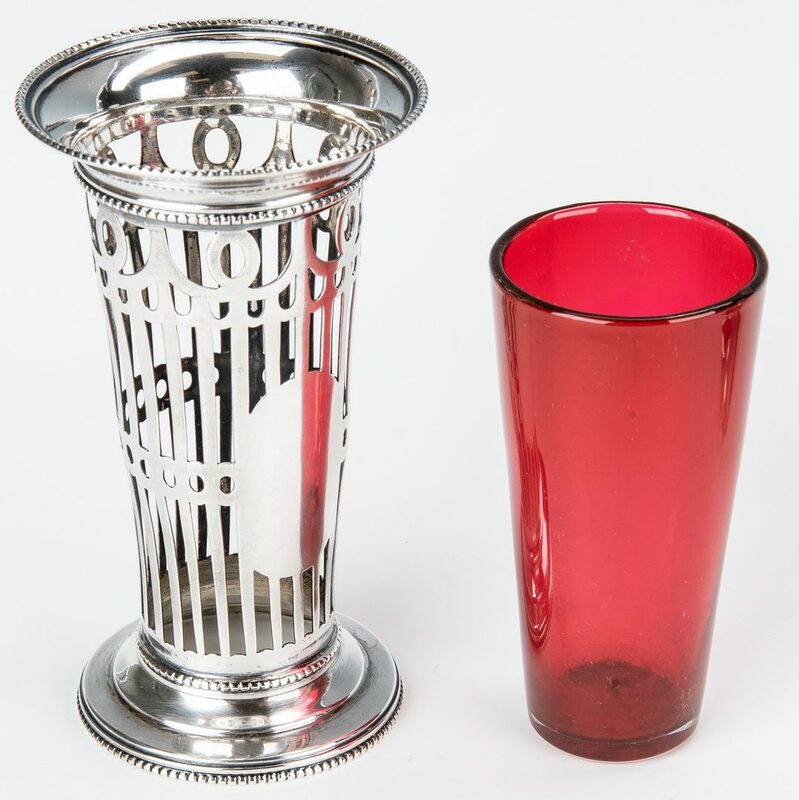 4th group: 2 sterling table items including tea cup or baby cup by John Wanamaker, 2 3/4" H, and Dominick and Haff sterling overlay cranberry glass flower vase, 5" H, 6.62 weighable oz troy without glass insert. 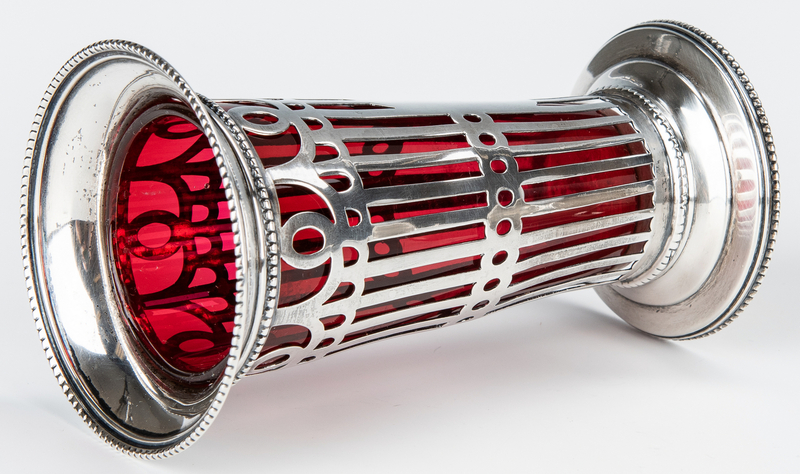 17.62 weighable oz troy total. 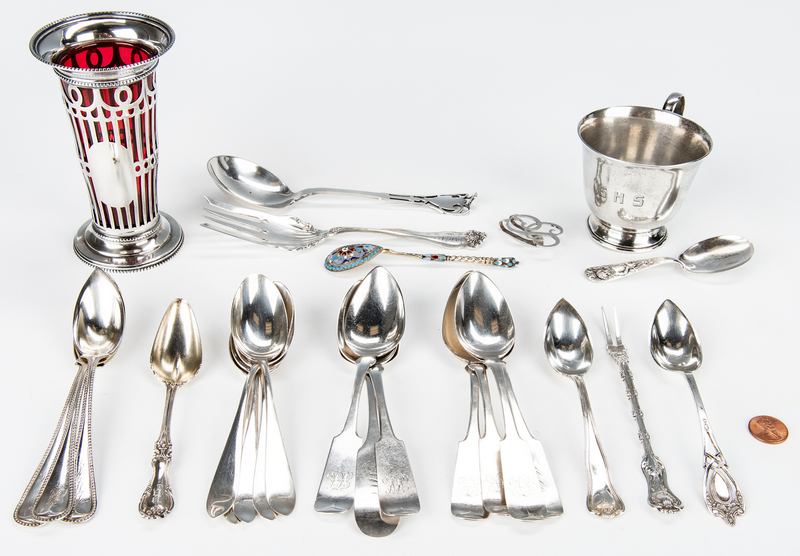 2nd assorted 23 items: 7-piece German 800 silver fruit set including serving spoon (8: L) and 6 fruit spoons (5 1/4" L), all with stylized gilt bowls and Art Deco tips, 5.745 oz troy/set; Two Native American silver teaspoons, both with bust tips and one bowl marked Navajo, 5" and 5 3/8" L, one bowl with damage, no marks en verso, 0.86 oz troy; 8 assorted sterling silver souvenir spoons including gilt enamel Canada and sterling shamrock, by various makers, 2.685 oz troy/8; 1 830 silver Norwegian spoon with twisted hangle, 0.365 oz troy; and 5 assorted 800 silver souvenir spoons, mostly with enamel tips, 1.87 oz troy/5. 20.305 total 925 sterling. 50 items total. 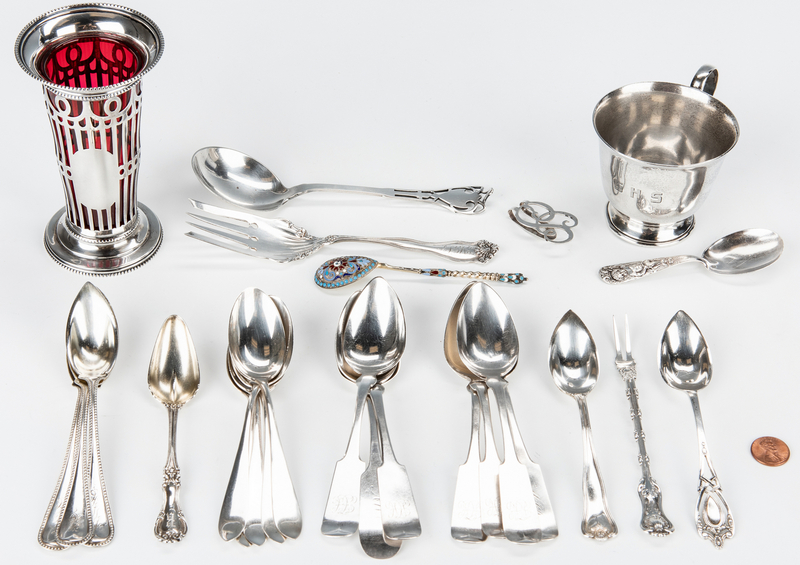 CONDITION: All items in good condition. 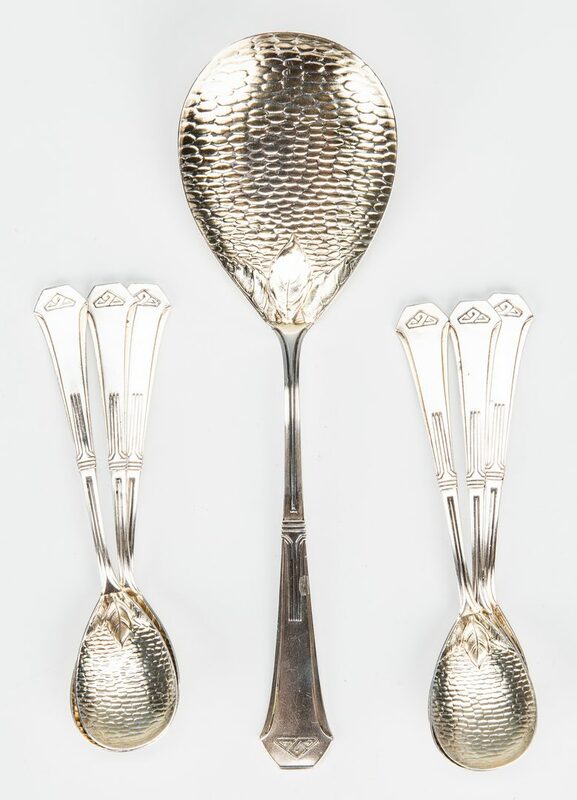 Russian spoon with some polishing residue. 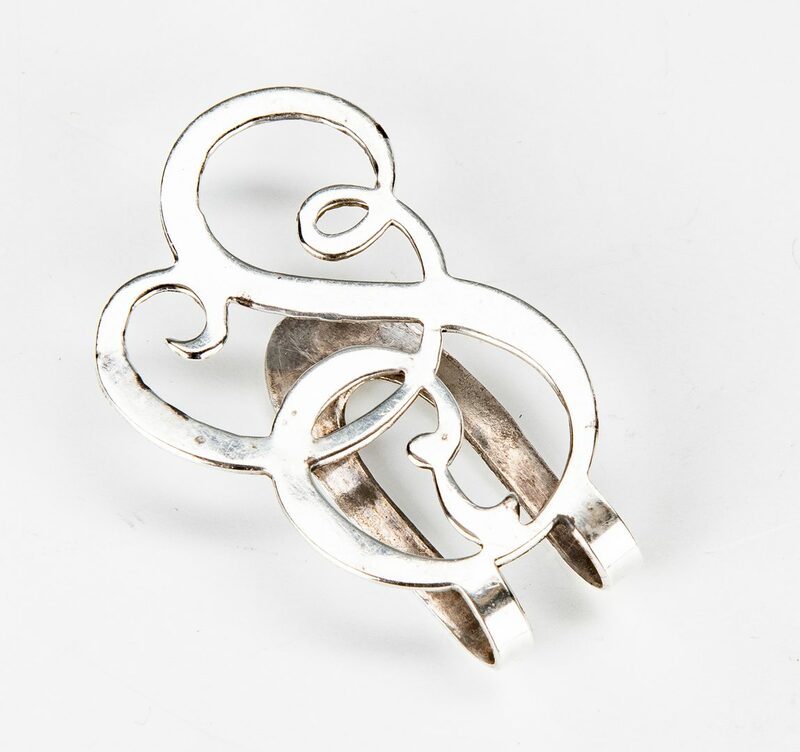 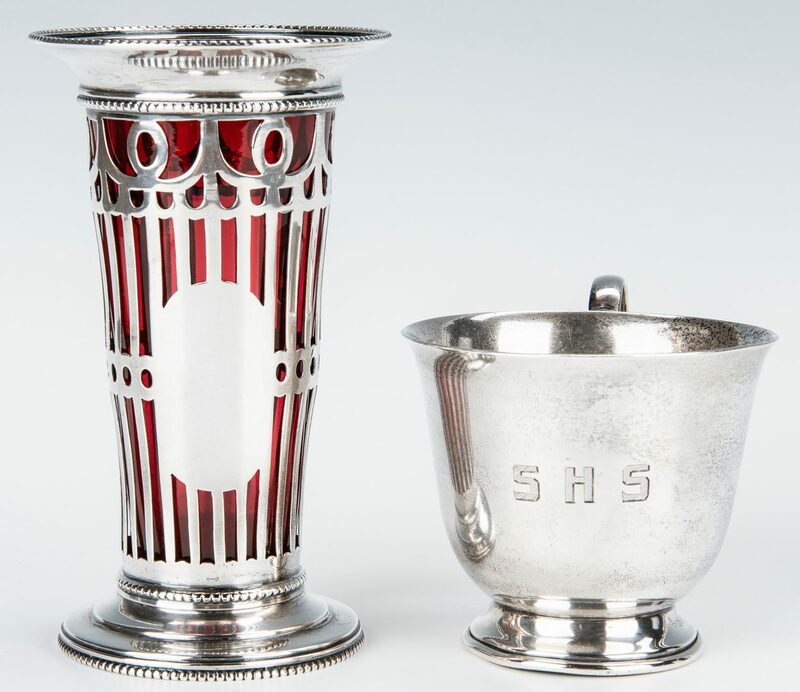 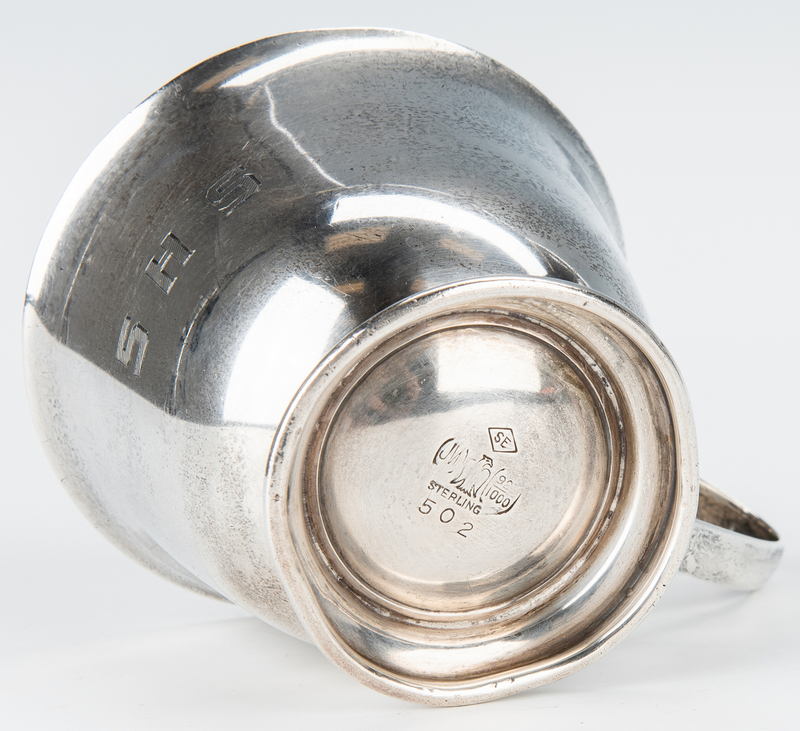 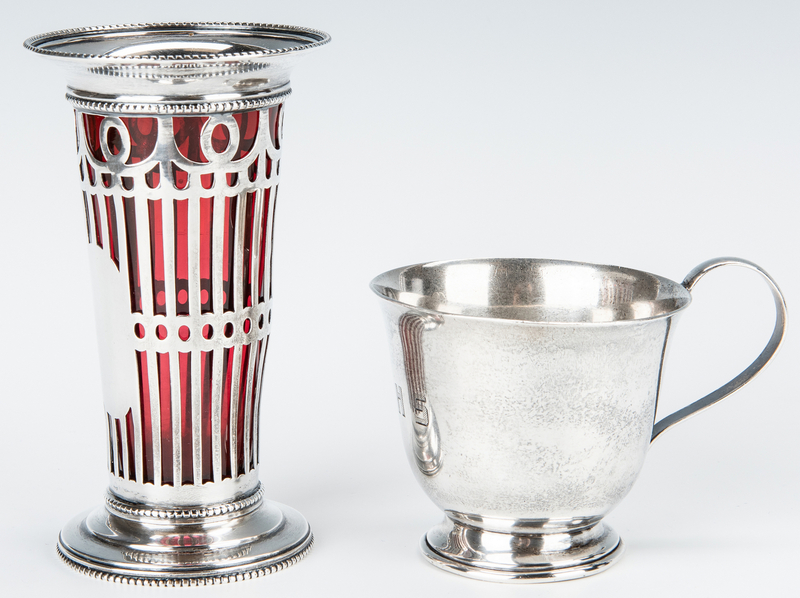 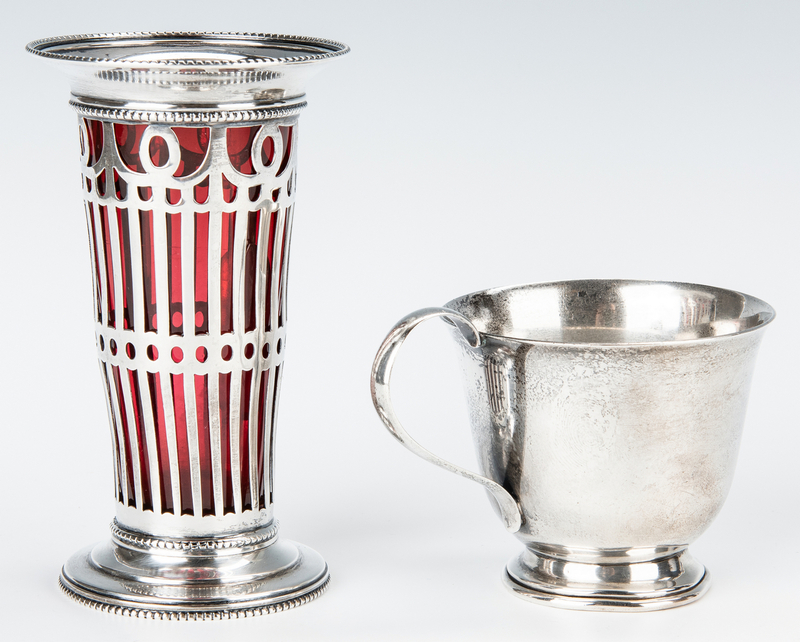 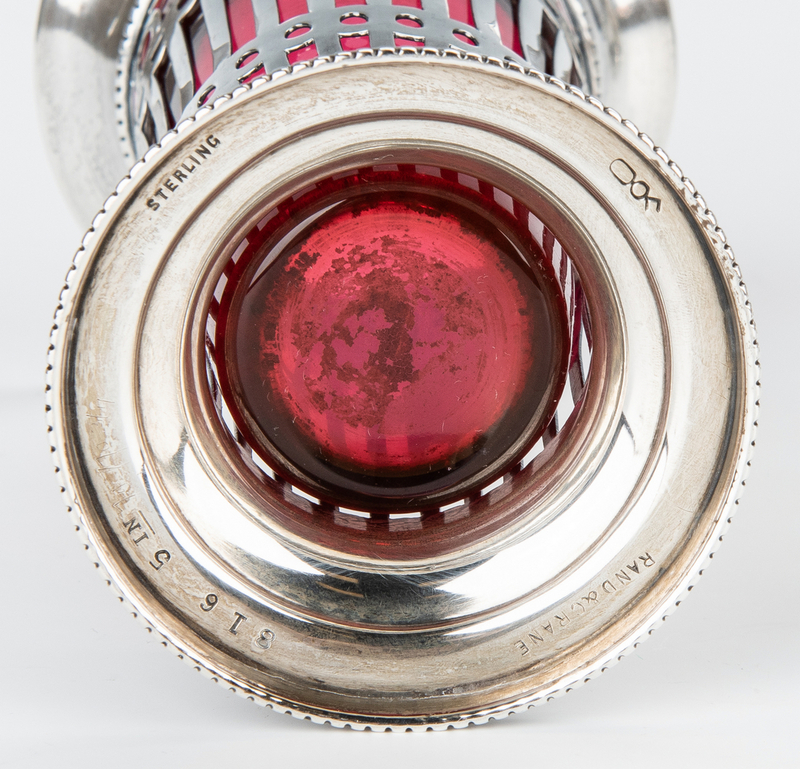 Sterling cup with 3 initials. 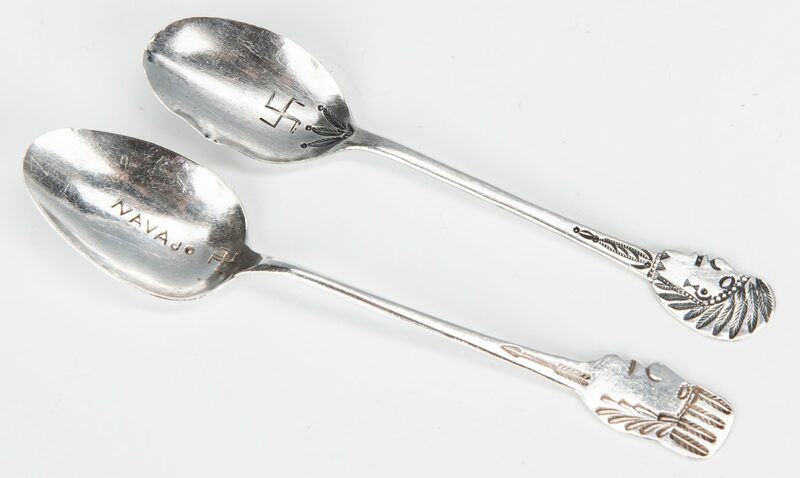 All coin spoons and 12 flatware items with monograms.